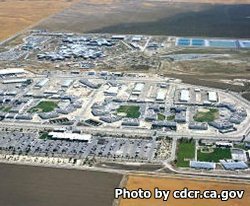 Pleasant Valley State Prison is located in Coalinga California. It provides the secure treatment and rehabilitation of minimum to maximum security offenders. Inmates at this facility can take classes to learn how to read, obtain an adult basic education, GED, or even learn English. These educational opportunities are given to the inmates because they give the offender a greater chance at obtaining a job once they are released. Inmates serving time at Pleasant Valley State Prison can work in the surrounding towns by joining the community service crew. Offenders can also gain a variety of vocational skills such as computer and auto repair, HVAC, carpentry, masonry, gardening, building maintenance and electrical and plumbing. Inmates are taught these vocational skills to give them real life experience in jobs they can obtain once they are released and hopefully reduce the chance of the inmate entering into a correctional facility again. Visitors must be approved prior to visiting. Visiting is on Saturdays and Sundays from 8:30am-3pm, you must arrive prior to 2pm or you will not be allowed to enter visitation. Visitors are also permitted on four holidays during the same hours (New Year's day, July 4th, Thanksgiving and Christmas day). If your inmate is in segregation or can only have non-contact visits you must schedule a visiting appointment online here.